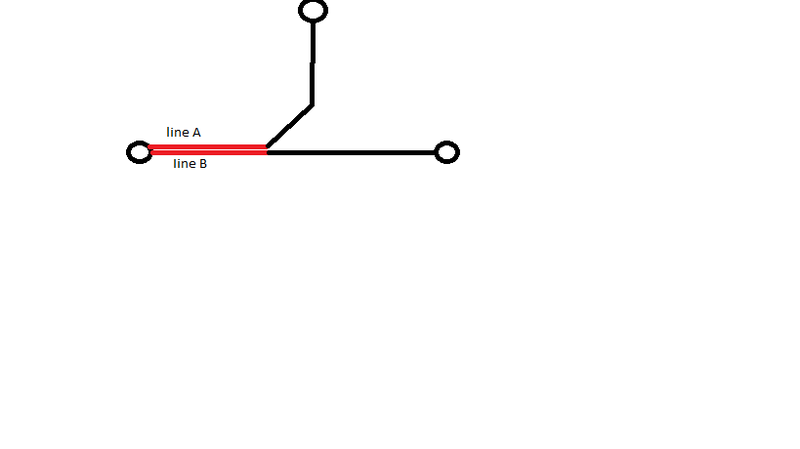 I have 2 lines Line A, and Line B that share from point. The 2 lines at first share the same path and are parallel, then they split into different paths. I would like to calculate that segment in which they are parallel. Picture below further explains visually. Red part is the wanted part. Note that the red segment might be multiple connected segments that make up the red path of each Polyline. I doubt there is an interface in the arcobjects in which calculates this, which means I have to calculate it manually. I need some suggestions to get the best accurate result of the shared length. I would access ITopologyExtension.MapTopology, call IMapTopology.AddClass to add your featureclass with a cluster tolerance a bit larger than the distance between the parallel lines. Call ITopologyGraph.Build, then loop through each topology edge via ITopologyGraph.Edges, to populate a List<IGeometry> with geometries from ITopologyEdge.Geometry for edges where ITopologyEdge.Parents yields more than one parent. I've also used a custom layer extension using ILayerExtensionDraw so that it simply draws the geometries (in red) for topology edges with more than one parent. If the resulting geometry contains multiple geometries, you can cast the result to IGeometryCollection, and iterate through the parts. Not the answer you're looking for? Browse other questions tagged arcobjects distance geometry or ask your own question. Distance-direction computation of lines with exactly/more than two nodes?